I have said before that in the later half of the franchise the even numbered movies are better, and in the first half the odd numbered ones are better. As a result The Stone of Cold Fire (7) and The Big Freeze (8) gave me very high hopes here. The full CG trilogy is loved by critics, and critics loved this one, but the audiences did not like it. Part of that is audiences watch children films many times, while critics only watch them once. It is fine on a first watch partly due to some charm, but after just a few watches there is very little to like. This will be hard to write. Dev Ross helped wright the second film and the next two films by herself. After that this is her only role in the series. She is not as good as John Loy at making two different conflicts connect. One reason this is dull is that there is only one conflict. Getting to Big Water is supposed to be one, but it is really not a challenge. Charles Grosvenor is again the director. 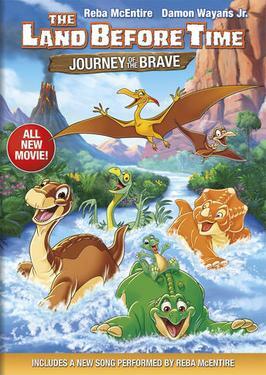 this is the last film to use James Horner’s score from the original untouched and play “If We Hold on Together.” It is the last time Thomas Dekker voiced Littlefoot, and he won an award for it. There is so little plot, and there is no real point to telling it in order. The absolute best parts are small scenes. Starting in 7 Mr. Threehorn was starting to like Littlefoot more, and he shows the best confidence in him throughout the series, when he assures everyone else the gang will make it back home. The ending has some nice parts like when Littlefoot looks into the water. I also like the grasshoppers for some reason. Another good part is just looking at The Great Valley. 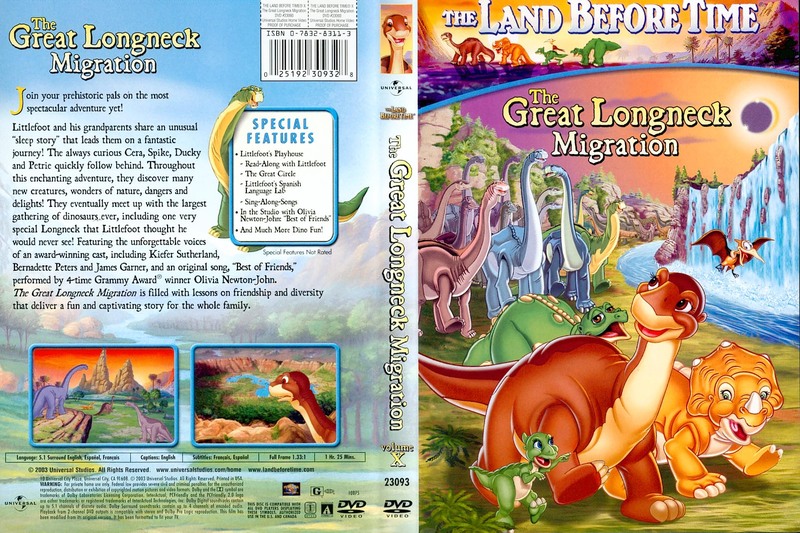 I am convinced this film was practically ignored for making The Great Longneck Migration (10) in production. Loy was not working on it. Its story is overly simple and it relies way too much on nostalgia from The Mysterious Island (5). It is just too simple. Help a fish get home who does not really seem interested. Get chased by sharptooth (this is the only film without a land sharptooth). Mo is a major focus, and he is just not a good character. He loves having fun and becomes very aggressive when his friends are in danger. I think Cera was right to say he is not really interested in getting home. None of his gags are funny, but at least they are not slow. Seeing him save the day in the climax just seemed odd. Littlefoot’s voice with Thomas Dekker was very good, but I could tell he was reaching puberty. I really think Spike fit his role better, but he cannot talk so Littlefoot gets it. One of the sequels’ best parts is how Cera became nicer. Clearly the first one influenced her so much that she changed. We saw it ending in the first one, and the producers knew we were smart enough to realize character development was needed. Here she is way meaner than usual. It is supposedly jealousy of Mo, but it makes little sense, and it is not very interesting. Petrie strangely is the smart one. Ducky is at least good with Mrs. Mama. Spike is not used much. The real best thing is the songs. “Chanson D’ Ennui” is incredibly catchy, and I mostly watched the film for this song. It is vey fun to sing and surprisingly not boring. I expected to rip “Imaginary Friends Apart,” but I actually enjoyed it. “No One has to be Alone” was heavily promoted, but it is just bland. The reprise of “Big Water” was good as expected, but it relied too much on the audience having seen the fifth one. The first usage of “If We Hold on together” was too dull. The second time was actually appropriate. 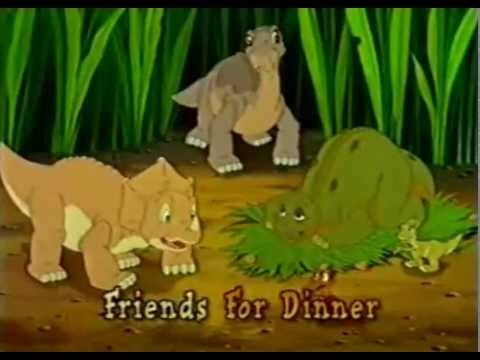 A funny moment is when Littlefoot’s friends are a little mad and it plays the bully theme from 3. The worst part is by far the middle action scene. It puts Mo in a really bad light. The music acts like it is dramatic, but it is not. He needs to go over some rocks, but you can see areas around he can go over. It also makes a plot hole about how the sharptooth swimmer (why not “swimming sharptooth”) got around. It also has a very bad Free Willy Reference. The climax ends very badly but the sharptooth swimmer is actually intimidating. This is just a dull film. Similar to the Jumpstart ads it ends with. The five best songs are now 1. Bestest friends (10) 2. Adventuring (10). 3. flip, Flap, Fly (12). 4. How do You Know (13). 5. Chanson D’ Ennui (9). The new film rankings are 10, 14, 12, 11, 9, 13. This is one of the most remembered films in the series, and it I often considered the best. The Beethoven’s 5th commercial is better than the film. I like the other trailers except for Sinibad. It is a fine film, but the trailer is a reason why it bombed terribly. What is a major difference between Charles Grosvenor and Roy Allen Smith, the only two directors to do more than one film in the franchise? Grosvenor is better at coming up with plots, while Smith is better at developing them. The tenth film had on paper and screen the best plot of at least the sequels and maybe even the original. It had a big plot that took full advantage of being so late in a series, and it made many right moves with red herrings, songs, twists, and a mystery making it on paper by leaps and bounds the best sequel. There is one problem I cannot find out, and hopefully I will figure out why I do not consider it to be the best. Of notable significance is this ends the full CG trilogy, which let the internal conflict come from the internal instead of the other way around. It also is the first film to use no music composed by James Horner. The usual list of creators is present. 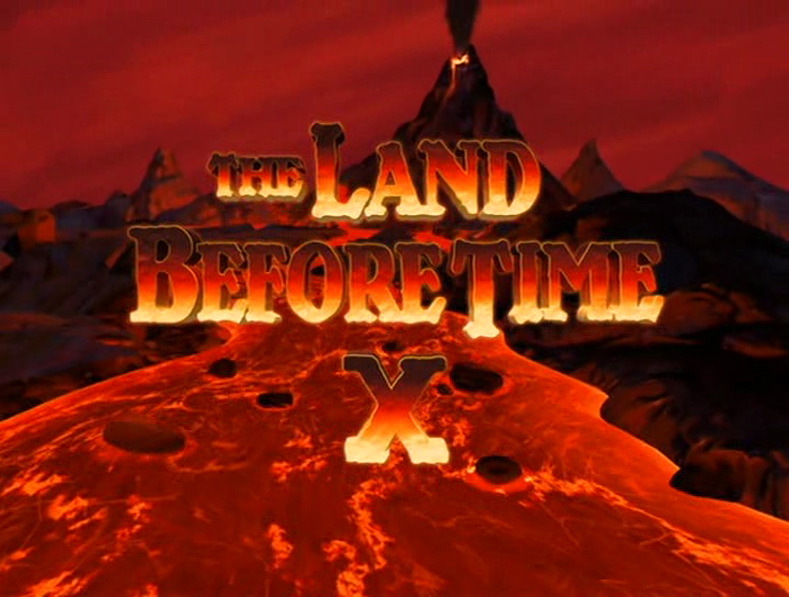 I love this opening with the lava and a sharptooth fighting a longneck foreshadowing the climax. It then has Littlefoot having a dream where there is less gravity. Alec Medlock is now voicing him. Going in reverse order this is normal, but in normal order this is important since Thomas Dekker was involved in his voice for a record five movies. Normally scenes like this leave it as a small twist, and I was happy the writers did something different. It then get a little odd as the sun literally falls, and it is revealed Grandma and Grandpa are having a similar dream. It is never explained why all longnecks have this dream, but it seems to be part of intuition and a mystery that the viewers need to solve. 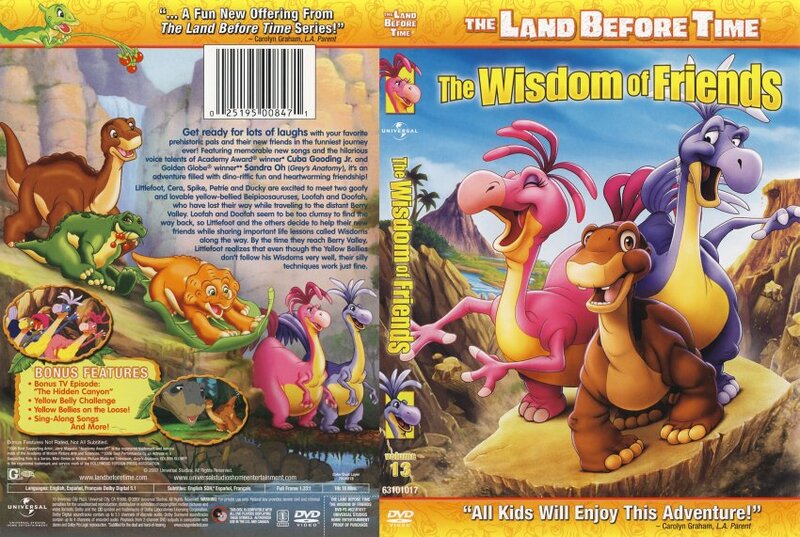 I think it is instinct, which further shows how bad The Land Before Time XIII The Wisdom of Friends (13) is. The next scene is surprisingly poor. It is the group playing tag, and eventually Littlefoot is too caught up in the sun, which results in him telling them about his dream (“Sleep Story”). Ducky and Petrie’s dreams are too generic to species instead of personality, but Petrie’s could be interpreted as getting braver. Cera calls them all dumb prompting Littlefoot to get some complicated revenge hurting her “brag bone.” After another night in a well done slow scene Grandpa tells Littlefoot they will be going on a journey, and this is the first time that a grown up suggested the journey. It leads to our first song, “Adventuring.” I love it, and it is the new top song. It promises adventure, heroism, Cera’s cynicism compared to everyone else’s optimism is funny. It gives Mo a cameo (my brother was excited to see that in the trailer). It also involves very fast editing to give an action scene feeling, and at the end it asks to what will be an important part of the movie, Littlefoot’s friends wanting to come too. 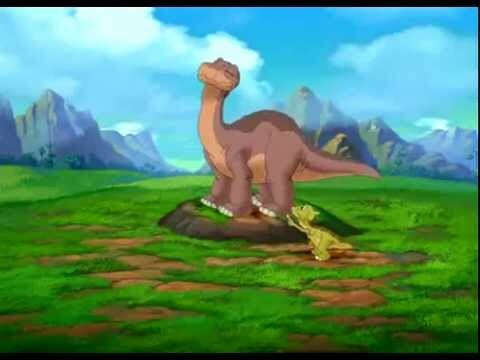 After that when Littlefoot leaves it is strangely shown that he is sad when he was earlier happy. Maybe “Adventuring” does have a problem about not being too relevant to the story. This is actually the first scene that is better on the rewatch where the tune to “Bestest Friends” is played when Cera, Ducky, Petrie, and Spike are missing him. The Longnecks are then in the desert part of the Mysterious Beyond, and then the rainforest later. Over there they meet Sue. I spent a bit of time wondering what Sue’ seemingly meaningless role is until I realized why it works. She is a red herring main guest character. It makes the real guest star even more of a shocker later. Then comes Cera’s nightmare, the funnies part of the franchise. I think this is the last appearance of the brown stegosaurus. It always gives a really good laugh and it seems to show Cera just being arrogant, but also that she fears missing out on important adventures, and most importantly that she knows something incredibly important is about to happen. The little part with Mr. Threehorn cheering for Littlefoot the loudest is very fitting in chronological order. He had been warming up to him since at least The Big Freeze (8) and maybe even The Stone of Cold Fire (7). With that Cera rounds up the rest of the group to follow Littlefoot. It shows how much Cera has developed that she is not leading them to certain death. Based on earlier sequels and the most recent Spike would be in charge, but consider it middle installment weirdness. After some atmosphere is shown with the Longnecks to again praise the film the rest of the group follow their footmarks to find the swamp with a prehistoric crocodile. It is a very good action scene except for too much dumb luck saving the group and the crocodile deeming Petrie a better meal than Cera. I guess fliers taste wonderful compared to threehorns. After escaping the first gray sharptooth in the franchise that is not a velociraptor (still a first to make it stick out), and with how dumb it was fortunately it will not be important to a serious climax later. They meet an old longneck named Pat. Pat is important to the theme and climax but not to the main story. The Longnecks are now in an enormous herd, and they stop in a giant crater that they think was made by the sun. It is never explained but theoretically a meteorite from a long time ago or potentially giant moles. In the crater Littlefoot gets in a fight with Shorty, and Shorty’s surrogate dad, Bron comes. In a rewatch this is better, as we know Bron is being a surrogate dad and an unknowing biological dad at the same time. After he gets Shorty to apologize Grandpa comes up and gives the franchise’s biggest (or second biggest) wham line “Littlefoot, this is your father.” This scene does not work nearly so well on a rewatch, but I remember being very surprised as just a month before watching it my family was talking about how Littlefoot’s dad almost certainly died before the first one or in the great earth shake. Littlefoot then captures the longtime audience perfectly by running away and wondering where was he all this time. It also captures Bron’s sadness fairly well. I will add that the longnecks in the background look very distinct. There is an Ultrasaurus and a Saltasaurus. They are all different colors. Bron finds Littlefoot and tells him what happened. He left to find the right place for a nest and was gone longer than suspected. This does fit into the story of the original, as they stopped going to The Great Valley only to nest. Apparently he got really lost, which is justified as he did not know where the nest was made earlier. It also makes it easy to assume he had some great untold adventures. He only quit looking when he became a leader of a herd due to helping every young lost longneck he found, and there were many due to the recent deaths, and he had great evidence Littlefoot was dead. It was very important to make this good since many fans looked forward to Allie or Doc showing up again in this film, and many fans thought Doc was Littlefoot’s father. I think this explanation is great. It keeps him very likable, but sows a real vulnerability. It leads to a sweet song, “Me and my Dad.” It ties well into having to choose family or friends and is a very sweet song. It is the least good song in the film, but it is still good. After that it is shown that Shorty feels like Bron will now ignore him like everyone else. I think Shorty is the worst character here, as he is too one dimensional annoying despite having a complex back story. With Pat, Cera, Ducky, Petrie, and Spike Pat tells the story of how they think an eclipse is the bright circle falling. I like part of the mythology like the moon being jealous of the sun, but I think it makes parts of the climax underwhelming when there is no real danger. For some reason they are going through a place full of lava, and it burns Pat’s foot really bad. He tells everyone else to go on with out him, but they choose friendship in need over friendship that is not in need and excitement. It is a good scene that is very important to the ending and tying the two major plots together. The climax basically starts with Shorty leaving until Littlefoot acts like he is a brother. It also shows more and more that Littlefoot will have to choose between his dad and grandparents. Bron wants to be with Littlefoot and supports him to come back with him. Grandpa is less decisive, but he thinks Littlefoot will choose his dad, and he is being supportive of it. Getting Littlefoot and Shorty out is an excuse for them to run into Petrie who tells Littlefoot his friends are coming. The climax has so many incredible parts, but also it has two key mistakes. I was wondering when I saw it why it was not the earlier Gray sharptooth. I quickly forget when Pat throws him against a tree. 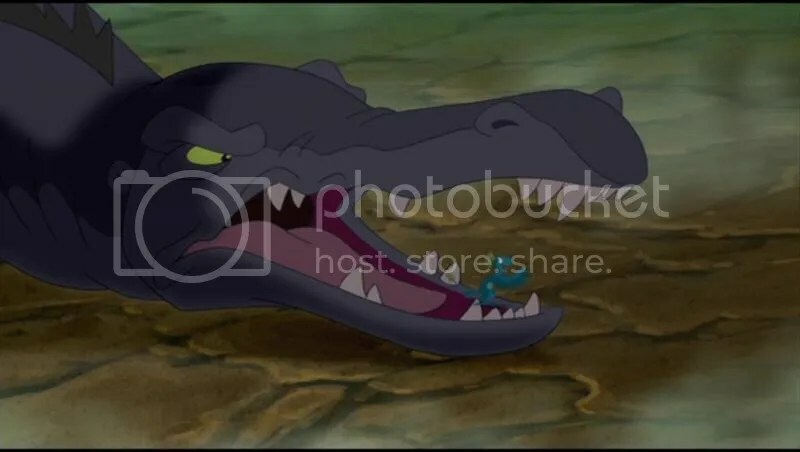 It looks good that the children will get to the safety of the crater and Pat has brown sharptooth beaten until the camera show his burned leg, and it becomes apparent Pat cannot stand well. to move sharptooth forward where Grandma can trip him off cliff. It is the first time they fought together since Two. With the gray sharptooth Pat is overmatched, but Cera knocks one leg up by ramming him (I will buy it) and Shorty gets underneath the other leg, which trips Gray Sharptooth instead of squashing him. As an adult I find this to be a major problem, but as a kid I thought that was cool, so I will let it pass. Gray falls down and Bron guides Brown Sharptooth into his fall taking them both out. An important moment to the theme is Littlefoot goes to his dad first. If he had to make the choice now he would choose his dad, but Bron tells him to go to Grandpa. It gives an implication his Grandpa needs Littlefoot more than Bron does, and it is implied he is keeping his son away from Brown Sharptooth, the most dangerous. We then get to the second major problem with this climax. I like the art of the eclipse, and these sharpteeth are amazing to somehow still go strong, but the eclipse is just no real danger. It gives Sue some lines that should have gone to grandma. We then get to the choice that made me certain that Littlefoot was going to leave with his dad, and the franchise would end… That is why this is no where near as good after the first watch. It relies so heavily on twists and red herrings, and it works because I was so attached to these characters. It took all of the viewers’ attachments and made the emotional moments really strong. It actually backfired later due to making it seem like we were outgrowing the franchise when we put it in again. It leads to the new top song “Bestest Friends.” Michele Bourman and Amanda McBroom really out did themselves here. It is rightly played over the end credits, and this is a real tear jerker. Besides “If I had Words” from Babe this is the saddest song I ever heard especially when you think of friends who left. The actors singing especially Cera’s actress, Andi McAfee, are terrific. This one had me one hundred percent convinced the series was about to end, and Littlefoot would go with his dad. I was truly shocked when he chose to stay in The Great Valley. Besides Sue the new characters are great, and I was disappointed Pat did not speak in the Later Sequel trilogy. It had great music, a flawed, but very good climax. Littlefoot was done wonderfully. The rest of the gang blurs in this one as one great unit. The two distinct stories merged so well. Bron was wonderful. This is the new top ranking film, and it will possibly have this distinction for a long time. The five best songs are now 1. Bestest friends (10) 2. Adventuring (10). 3. flip, Flap, Fly (12). 4. How do You Know (13). 5. Things Change (12). The new running time order is 10 (85 minutes), 14 (82 minutes) 12/11 (81 minutes each), 13 (76 minutes). The new film rankings are 10, 14, 12, 11, 13. I came into this review thinking this just might have a chance at being lower than The Wisdom of Friends (13), but I was wrong. It has plenty of problems, but it is much better. This is the last of the franchise I saw as the target demographic, but I never owned a copy until I decided to complete the series. I remember being okay with it, but I did not want to see it again really. Many fans consider The Great Day of the Fliers (12) a successor to The Stone of Cold Fire (7). They said Pterano should have made an appearance. That is wrong as Pterano would have been an unnecessary distraction, and besides focusing on Petrie there are no notable similarities. 11 Is obviously similar to The Great Valley Adventure (2). Both take place mostly in the great valley. Both deal with Littlefoot feeling too small. Both are the only ones that involve sharpteeth invading the great valley (technically done in 9 but not as a major plot point). It supports my theory that starting with 11 the producers were trying to bring a new audience in that they heavily looked at the first sequel, and made the tenth one to be like the first one to give closing to old fans and be the original to new fans. The plan did not work. For older fans there is no need to watch 11 instead of 2 and for newer fans it is just not good enough to encourage more interest. Another problem is the films typically came out a little before Christmas giving parents time to gift them to their children. This started a trend of releasing them in February removing that. 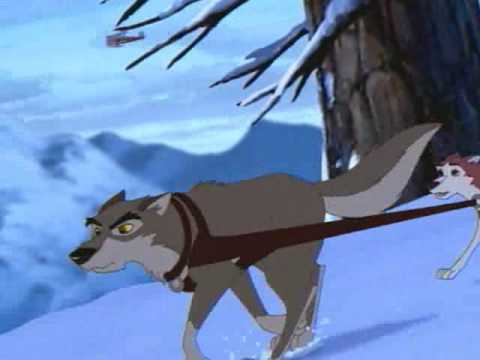 Universal typically has great commercials, and the one for Balto III is great. It seems similar enough to the original, but also plenty different. It gives a good indication of a bull moose attack. It also has the same music as the toy Story commercial. I think Thunderbirds was advertised as a mock buster to Power Rangers, which is not good. the Shark Tale commercial gives me no interest. Of note for 11 is that again John Loy is the writer and Charles Grosvenor is the director. Aaron Spann is again a voice actor for Littlefoot that will only last one movie. There are a surprisingly high seven of them (but Cody Arens did return for the TV series). This is the last film to use music from the original, but none of it is from “For if we Hold on Together.” It came out when I was nine, but I probably saw it at ten years old. This did not kill my interest in the series, but it did not let it build. The theme seems to change. For one small details are important. Do not lie. Those are at least connected in song (again), but it is rather good. Lies can be small and be very bad similar to how “the tiny ones” are small and can be important. The worst character in the series seems to show always be nice to people especially the hypocrite Mary Sues. The introduction is very fine at first. Universal logo is great as always. I also really like how it shows the atoms and molecules to show the importance of small things. After that it gets worse. The immediate plot is the group wants to eat some “tree sweets,” which are at their best once a year. Not too exciting. It is hard to realize today is not “nibbling day.” We then get to another early problem. Petrie is trying to get one, and Mr. Threehorn yells at him, but it is hard to hear his yell. It looks like Petrie just fell. It turns out Mr. Threehorn is in charge of watching the tree sweets. Based on the name I guess they are supposed to be dinosaur junk food. The introduction becomes good again. Mr. Threehorn is portrayed as very harsh, but unlike most times it is harsh for the right reasons, everyone will get some of the tree sweets, since they are the best. It is also shown that Cera thinks she will get the first one, which I have trouble seeing much meaning behind. From there the next plot point comes, Littlefoot being too short. According to Cera (and everyone else later) Littlefoot is short by Longnecks his age standards. Since he is mostly with non-longnecks I do not see much of a problem. Until he tries to prove to himself he is big enough to get the first tree sweet from the top of a tree and falls knocking every one down. Is that even possible? He then faints. 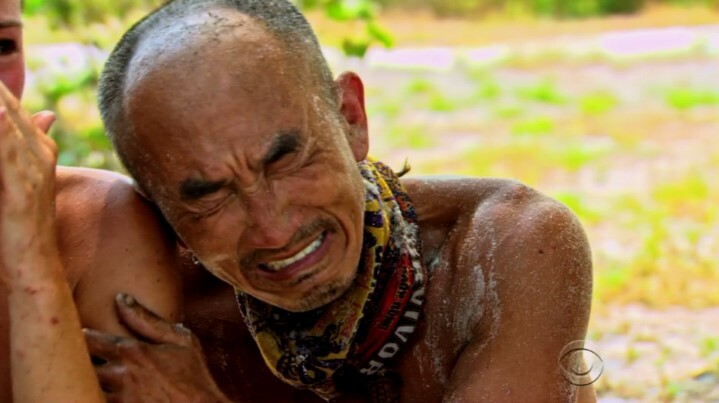 Considering all he has made it through I am surprised he only faints here instead of when his mom died or when he was attacked by sharpteeth all those previous times. Clearly they are portraying Littlefoot as more flawed here, but it comes off more ridiculous. They should have taken inspiration from The Secret of Saurusrock (6). It portrayed Littlefoot as more flawed, while staying very true to him and having the viewers rooting for him when they needed to. Everyone who saw the cover probably then knew the titular “Tiny ones” would eat everything. Fortunately when I first saw it I missed the opening titles and the box, so this was still surprising. Littlefoot then flees wen Mr. Threehorn comes with the worst character in the series, Tria. I have not explained my hatred for her in later films, but now is the time. She is portrayed as so positive, yet she is nothing but a supposedly flawless (but somewhat love struck) hero, but she is incredibly shallow and self-righteous. She is shown as like a high school girlfriend. It is never explained then why Mr. Threehorn (I am not calling him Topsy, which I consider to be a pet name) chose Cera’s mom over her way back. She also almost never calls him anything good but synonyms for handsome. It makes her seem so shallow. At least it gives us the interesting part where Cera overhears them saying Tria will get the first tree sweet, which she later brags about to everyone. She is just the shallow person who brags that his/her spouse is important. With these three surprisingly well connected plot threads (good job editing Jay Bixsen, as someone has to make this work) Mr. Threehorn is holding a meeting. Normally I find The Great Valley dinosaurs listen to him too much due to his disastrous leadership in The Time of the Great Giving (3), but I think enough time has passed for them to forgive and forget. Mr. Threehorn says someone stole from them and Littlefoot panics an screams “I didn’t do it.” Arguably this fits Littlefoot’s not-so-stoic personality, but I cannot see him losing over something with no great emotional loss. All he had to do was stay quiet. With the eyes on him Tria says she saw him running away. Saved eveyone’s life in 3 at least once and twice for most. Saved their great leader in 4. Saved everyone’s life in 8. They think he saved all their lives in 10. No one but Mr. Threehorn seems to know her. Littlefoot made problems in 2. At best for most dinosaurs they owe Littlefoot at least four life debts. It could be argued Littlefoot putting them in danger (which basically only a small group faced ends one. Also they came to save them in 5 (where they got saved). The only grown ups to seek him out so save him since are Mr. Thicknose, Grandma and Grandpa. That still leaves everyone with two life debts to Littlefoot assuming practically nothing counts as repayment. Littlefoot should be considered too important to touch, but the entire Valley just about is against him. This is easily the most negative the valley has ever been or will be portrayed. Littlefoot makes up a story that the Tiny Ones got them without his accidental help, and no one believes him until Mr. Threehorn finds evidence. Since only three movies ago Littlefoot’s bizarre story lead them to survival and four movies ago he saw a stone of cold fire that was proven true why believe him now. Also Mr. Threehorn must be the greatest politician of all time to have these ungrateful idiots believe everything he says. Did he invent mind control? Mr. Club Tail just spoke for the first time since The Mysterious Island (5). He now has a completely different voice (by Jeff Bennet instead of Rob Paulsen) and personality. After that Mr. Threehorn leads in his first song since 3, “Creepy Crawlies.” It is told in two parts and the part sang by Ducky and Petrie is superior. I think it counts as a villain song for showing the villainous sides of our heroes in a man vs himself story. It is surprisingly fast, and it is a slightly better version of “Savages” from Pocahontas. It then shows that The Great Valley dinosaurs are not capable of finding something so small. Did they kick out their good trackers and smaller members? This is far from the smartest they have been portrayed. At least Petrie gives some good laughs at this part. Littlefoot falls into the hole, and things finally get much better. All right they do not get better until he is done screaming. I got tired of hearing him scream, and finding unusual sights should be Tuesday for him by now. Littlefoot eventually befriends them, due to his joy at feeling big again and presumably due to enjoying them. The only important ones are Skitter (I always liked that name), Lizzy (the oldest apparently), and Big Daddy. Michael Duncan voices Big Daddy with a great Kevin Michael Richardson impression. Big Daddy is very harsh but he trusts his children that Littlefoot did not rat them out earlier. I actually like it how the stern dad is very trusting probably knowing if wrong Littlefoot would not make a problem. He also makes a fine call that they are moving due to not being able to find food resulting in Littlefoot volunteering to bring them food back every night. I think this is a good one night plan, but after that burst of strength do not push luck. Cera catches up to Mr. Threehorn and Tria. All of their relationships seem so fake except Threehorn and Cera’s relationship. It is later revealed Cera does not like her due to the changes it will make, which is explained better in 12. After that the gang minus Littlefoot catches him moving tree stars, and they fall into the hole. Only Cera wants to keep to a secret, as this is not the gang’s most positive portrayal either. Cera gets the rest of the group to keep it a secret. Apparently Littlefoot’s leadership position is being challenged. How did that go last time? Big Daddy believes her with parent’s intuition, and the gang is shown having fun with the tiny ones, which is good for mood building. We then get to the second song “Girls and Dads.” When I watched it with he rest of my family my sisters said to make sure dad never heard it. It is obviously a parody of “Me and My Dad” from 10. I always found it dull and repetitive. It tells nothing knew that Lizzy and Cera did not discuss earlier. I am convinced that the budget on musicians and instruments for the songs was axed, as they sound way too similar now. There are then a few scenes of the gang being tired, and in one Cera runs into a tree and Tria shows up surprisingly angry. “Look Cera. I have tried every way I know to be nice to you.” Tria, you have told her hi and mocked her for being sleepy. If that is every way you now how then please get eaten. After that Mr. Threehorn catches the gang up at night and sends them home. Mr. Threehorn then catches Lizzy and Skitter looking for them. In a well done chase scene he finds their hide out. Tria realizes they are good guys because they are … “cute.” She really is he most shallow dinosaur on this show. The Yellow Bellies are better than her. Mr. Threehorn is now mad with her and she is furious at him. Who else is cheering for them to break up? After that literally the entire valley wants to clog the hole except Grandma and Grandpa. Littlefoot stops the by admitting his lie, but a rock slide from the rocks Mr. Threehorn and Mr. Clubtail moved still clogs it. 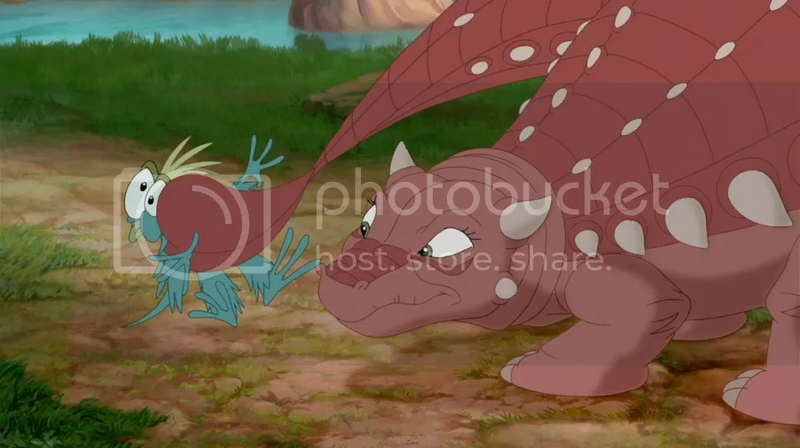 It then shows Tria mad at Mr. Threehorn and Littlefoot’s friends mad at him. In one way making the rocks fall is terrible, as it makes Littlefoot’s admission of guilt pointless. In another way is brilliant. Besides the first one this might be the lowest he has ever been, and I like that quite well. Did I mention how well the songs are paced here? Bisxsen is making up for his peers’ mistakes. “If Only” is the best song. It is ties in both main morals. It is a fine prep song, and it is also the only time Grandpa Longneck sings a song in the franchise. After a little bit of wasted time with Tria and an okay scene with Littlefoot’s friends being mad at him that serves as both comic relief and sadness ( a good feat to pull off) the Tiny ones venture to the desert part of the Mysterious Beyond to find Sharpteeth. The sharpteeth follow them through the tunnel and into a small hole leading to the Great Valley. First time with Fast Biters since 7, and the first time sharpteeth invaded since 2. The climax has to wait to resolve some internal tensions. 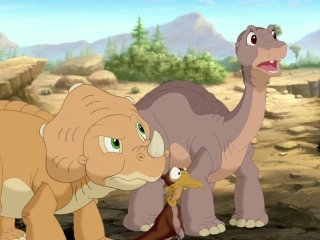 Ducky, Petrie, and Spike feel guilty about making Littlefoot mad. At least they are grateful to his past accomplishments and take offense about claims the other hurt him the worst. It is entertaining. With the real plot mostly wrapped up we get to the climatic sharptooth attack. Normally the gang fights by running and throwing rocks. Here they do everything but throw rocks. They pull branches back to hit them. They trip them with vines (another reference to 2), Spike trips one, and… Skitter and Lizzy come back to tickle one. I think there was key deleted scene with them. Sure tickling is odd, but at least it is new. The only problem is again Tria shows up to be totally useless. In fact it ends with the tiny ones and children hiding behind Mr. Threehorn and Tria is also hiding being him completely useless, and the velociraptors are using their numbers advantage to good use circling him. I am thinking Loy and Grosvenor hated her too. Fortunately the rest of the valley comes, but with how negatively they were portrayed I think only Grandpa coming to the rescue would seem more heroic. Also Grandpa and Mr. Clubtail are then clogging the hole, when it should have had Mr. Threehorn helping. Instead of a song from the film being in the end credits the tiny ones sing a reprise of “Creepy Crawlies” called “Stoopid Stompers,” which is actually better. The songs are the most mediocre in the series. Littlefoot is portrayed negatively and if it was not a sequel with an already established protagonist this would have been good. Cera adds some fine moments. Ducky, Petrie, and Spike gave some helpful comic relief but were too dumb for the discovery scene. Mr. Threehorn was actually very good here as a villainous protagonist. Tria is awful. Grandpa was very good in his limited screen time. The Tiny ones were surprisingly bland besides Big Daddy. The real weakness is the plot makes no sense due to already established personalities. Some major strengths include that the bad parts are normally entreatingly bad for their plot holes, it is never boring, and like most Don Bluth movies, the protagonist reaches a very low point emotionally. The songs are too medium to make any change in the best and worst songs list. The new climax rating is 12, 14, 11, 13. The new film rating is 14, 12, 11, 13. This was a very easy ranking spot. This is the last film I had not seen when I was the target demographic. I am trying to make my final rankings based off both my views as a child and an adult. Unlike The Wisdom of Friends (13) I saw trailers to this one. I really did not enjoy eleven too much and none of my family was still into the franchise so this is actually the last one before the franchise was brought back I saw, since I was more interested in what killed off the franchise in 13. I was finally able to figure out what is unique about the Later Sequels trilogy watching this one, it is for younger audiences. The terror is reduced. the songs and morals are more basic. I think they decided the audience was growing up so The Great Longneck Migration (10) was made to finish it for them, and the next films would try to make a new fanbase. This is the only one either group really liked much. It shows that in the second half the franchise the even numbered films are better. The basic is Petrie cannot fly in a group well, as he tries to fit in. Cera tries to stay fitting into her family, as she is about to get a half sister. The episode’s guest, Guido tries to fit in anywhere, as he does know of anyone like him. The theme is that it is better to be different than be too similar to everyone else. Of notable significance this is the last film to be directed by Charles Grosvenor or to have Kenneth Mars and John Ingle voice Grandpa Longneck and Mr. Threehorn respectively. 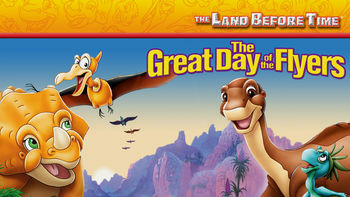 Grandpa Longneck has a small role where he tells Littlefoot about how important the great day of the fliers is. He also has some more comical moments later. Grandma Longneck never talks, but she does get to do the Heimlich maneuver. Mr. Threehorn is not too fun to watch with Tria around, but his scenes with Guido are actually really good, especially before he warms up to him. Petrie is the main focus. He has trouble flying in a group despite flying alone really well. Most likely this was caused by learning to fly by Sharptooth’s breath being what made him fly. This is further supported by there being two more call backs to the first one later. Petrie is mostly used as a voice of reason and the basic good protagonist. He is also shown to be the most willing to help and sacrificial. He also shows the problem with this one. Despite being enjoyable it is forgettable, and there is nothing notably memorable he does other than in the climax. Littlefoot is the idea person and narrator here. He often shows up to explain something. He is now played by Nick Price, who is great at having a voice that captures authority and intelligence, but it is probably for the best that his role was probably the smallest of all the films here. He always sounded the same, and he could not capture Littlefoot’s questioning voice when talking to grown ups, and it was obvious when he talked to Grandpa. Ducky and Spike do not have much of a role, but Ducky at least gets some good scenes in the sleepwalking part. Contrary to popular belief it is perfectly fine to wake up a sleep walker, and this actually supports it. My least favorite character in the series is Tria, but that is mostly for how she acts in Invasion of the Tinysauuses (11). Here she seems unnecessarily mean to Mr. Threehorn and Cera. Again it is not portrayed as a flaw. Her daughter, Tricia, I actually like, but the name is way too similar. I think it was a previous draft’s name, but her character is good, and I like seeing Cera have to be the responsible one. One of the best parts is the climax with the spinosaurus. It is right after the sleepwalking part, which is really funny. To add to it the gang is back in the desert part of the Mysterious Beyond making it look like there is no place to hide. Petrie is again the hero, as he is the one who can escape him. There is no rock throwing, as they usually do. The music is great. It also has my favorite call back to the first one. Petrie tells Guido to open his wings when the Spinosaurus is getting closer. He knows the breath will propel them forward the same way it taught him how to fly. It does only get Guido to fall with style, but it saves them. What weakens the climax is that it is more of a part 1 to it. This is the second film to have no music from the original film, and I think most of the music shows that it was made for previous sequels. It is a weak point. The songs include “One of a Kind.” I find it to just be forgettable, except where it connects Cera and Petrie’s stories. “Things Change” does appeal to me, but the beat and lyrics were too dull. “Flip, Flap, and Fly” was the song they played on the end credits, and I understand why. It has some good cameos. It is a fun song. It shows the theme well. It has some good excitement with the egg. I is obviously dangerous, but this film has not been very serious anyway with its tone. One benefit of having Jeff Bennet and Rob Paulsen voice Petrie and Spike is they can always rely on them to voice guest characters. Rob Paulsen’s Guido was a very pleasant surprise. He was funny and it was intelligent humor. He also played the heart this episode, and he di it really well. This is fun to watch, but it is forgettable. The three best songs are 3. Things Change (12) 2. How do you Know (13) 1.Flip, Flap, and Fly (12). The climax rating is 12, 14, 13. The film rating is now 14, 12, 13. This was very hard to determine between 12 and 14. I liked 14 more, but I came into this ranking expecting to put 12 first. I think I would have liked 12 more as a kid, but I cannot confirm that so 14 is top dog still. The first two challenges was worth 2.5 points. Losing costs 0.83. The fire making challenge was for 1.5 points. The final challenge was win 2 or lose 1.
four beauties finished in the top despite Michele being so bad in every challenge except the individual ones she won. If Nick did not drop out on his elimination episode he might have made it to five wins. 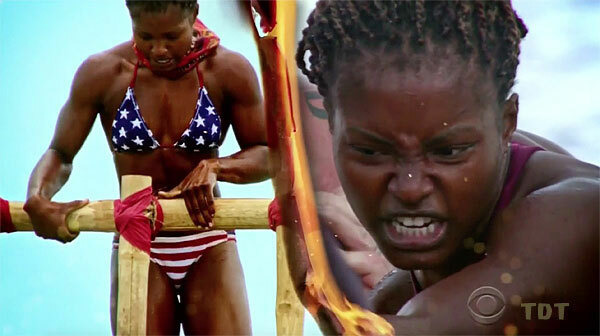 Aubry did so well at the challenges, but she had a very hard time actually winning at them.